Strawberry Milk: a blog for fabulously fashioned fetes. : Introducing: AppyCouple, the next big thing. Introducing: AppyCouple, the next big thing. I recently tested AppyCouple, a wedding app that is currently still in private BETA form, and used my own upcoming wedding as the guinea pig. It's everything you would expect to find on a couple's wedding website - and a whole lot more. You fill out the info once, and voila...you not only get your own wedding website but also a smartphone app with all the same content. It guides guests pretty seamlessly through the wedding experience. If one thing is for certain - brides won't be answering the same guest questions a zillion times. All the info is right there on their smartphone, which is of course always in hand (unlike a computer.) They can use it to track information about any pre or post wedding events, look up the registry while gift shopping, and on the wedding day to find their way to the venue and post photos that they take. Any time the bride and groom (or a guest) adds or changes content, it pushes out the update in real time to all the guests who have downloaded the app. How cool is that? While many existing wedding apps help brides and grooms plan things like seating arrangements, dress selections and registry creation, this app is a mobile aid for guests. Sharmeen Mitha-Sehgal, the co-founder and chief executive of Appy Couple, came up with the idea after what she describes as her sister’s disastrous attempt at organizing a 500-person wedding in Mumbai. Since I'm planning my own destination wedding in Paris, I can attest to how useful the app has been useful to communicate all of the festivities of the weekend to guests. Unlike a paper invitation that can be forgotten, this will be with them the whole trip to Paris so they can continue to re-check times, addresses, dress code, etc. 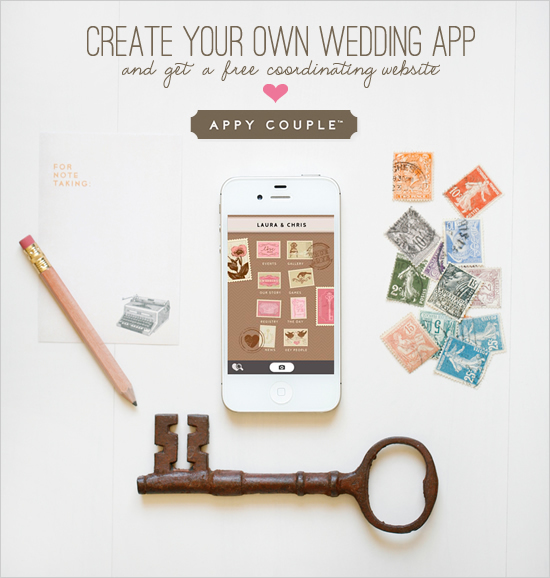 This app-creating website is currently free to use, and it will always be free for guests to download; they follow an email link or use a provided code to access their couple’s wedding app. Note: there is currently a 7,000 person waiting list. However, the first 10 readers of this blog can get in on the action early by using my code "4JULIE." The app is already being used in over 50 countries. In the fall, AppeProPo will start charging couples to make apps: Some designs will cost $49, while limited-edition and designer-series app templates will cost $99 to $200 each. One hundred designs are available now, and 50 more are coming by fall. Appy Couple works on iPhones, Android phones, iPads, Web browsers and via email invitations. Couples begin on AppyCouple.com, where a stylish, simple user interface walks them through seven steps for making their wedding app. Each app also comes with a wedding website that will display the same content for relatives or friends who don’t have smartphones. 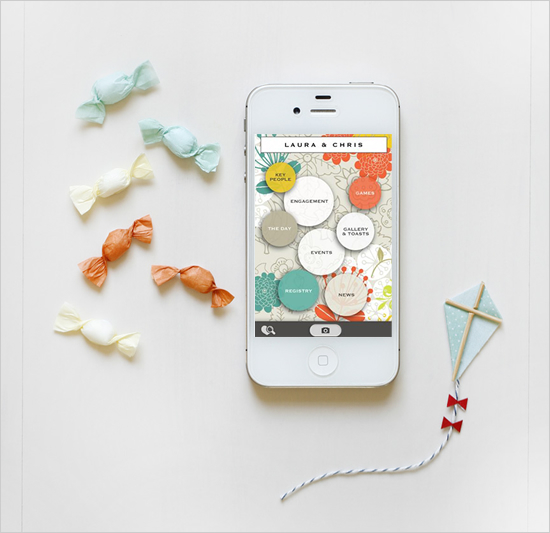 One of my favorite parts about creating a wedding app was that I could change its design at any time. With one click, the entire app was updated. As I mentione, I am getting married in the fall in Paris! 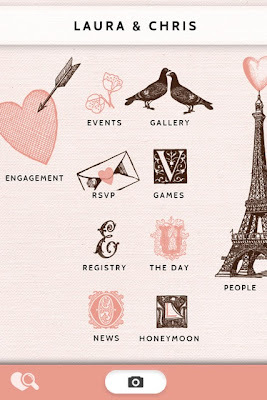 While I was testing the app out, AppyCouple was kind enough to customize a "Paris Dawn" theme to my wedding colors when I couldn't find one that suited our vibe in the design store. Now any new users can also take advantage of our pretty Paris theme! Another useful feature is the Events section. Only guests who are invited to certain events will see those events appear in their apps. So if only 15 friends are invited to the bachelorette party, only they—and not the rest of the guests—will see it. Couples can customize Events to add songs, guest polls, information on dress code, child care, weather, travel and hotels. Judging from the many weddings I’ve attended, Appy Couple’s Gallery will be the most-used section on the app. Friends and family can upload photos that can be viewed by the couple and other guests, and the app is sure to grow richer with their contributions. Images can be uploaded without pre-approval from the host couple, though any image can be deleted by the hosts on the AppyCouple.com website. A “moderation” option will be added to the app to give the couple more control over content. This app brings useful wedding website content on the go with guests as they attend weddings. If nothing else, they’ll know how to get to the church and when the ceremony starts—even if they forget to bring the paper invitation. Note: The app has a few minor rough spots that the company plans to smooth out soon. Overall, the app was very user friendly and an amazing tool! PS: Feel free to take a peek at our personal app - we customized a domain with two separate links: one to our weekend guide with lots of detailed information, things to do, etc. while in Paris and the other is AppyCouple. You won't be able to actually download our app without our wedding code, but you can get a good feel of it from the site. Most of the newly engaged people, they have no idea about how to start the wedding planning? This wedding app will really helpful for their wedding planning and it will helpful in each stage of planning the wedding.